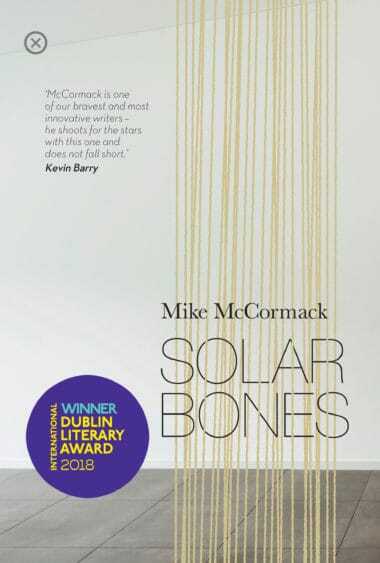 Tramp Press is delighted to announce that Mike McCormack’s Solar Bones has won the 2018 Dublin International Literary Award (previously called the IMPAC Award). ‘We are thrilled to see Mike McCormack’s extraordinary novel receive this important award. Solar Bones is an incredible book, and Mike is a great writer, teacher, and GAA fanatic, so it is fitting he should be celebrated with an award chosen by readers,’ said Lisa Coen, publisher at Tramp Press. ‘Mike McCormack is one of the world’s greatest living writers, and Solar Bones is a masterpiece. This recognition for his work is so wonderful and we could not be more delighted for him,’ added Sarah Davis-Goff (Tramp Press). Solar Bones has also won the Goldsmiths Prize, the Novel of the Year Award and Book of the Year awards at the Bord Gáis Energy Irish Book Awards, and was longlisted for the Man Booker Prize. Tramp Press is the first Irish publisher to win the award. After its initial publication and success in 2016 they partnered with Canongate in the UK to ensure it would be submitted for the Man Booker Prize; Solar Bones was published in the US with Soho Press. Rights have also sold, via Mike’s agent Marianne Gunn O’Connor, to Denmark, France, Germany, Italy, Spain, Greece and Holland. Marianne is the first Irish agent with an author to win the award. Funny and strange, McCormack’s ambitious and other-worldly novel plays with form and defies convention. A beautiful and haunting elegy, this story of order and chaos, love and loss captures how minor decisions ripple into waves and test our integrity in small ways every day. This profound work is by one of our most important contemporary novelists. MIKE MCCORMACK is an award-winning novelist and short story writer from Mayo. His previous work includes Notes from a Coma (2005), which was shortlisted for the Irish Book of the Year Award, and Forensic Songs (2012). In 1996 he was awarded the Rooney Prize for Irish Literature and in 2007 he was awarded a Civitella Ranieri Fellowship. In 2018 he was elected to the Aosdána.